I had high hopes this would help me. Maybe it would butthis formula definitely has some chondroitin sulfate in it. I have suffered extensive endless diarrhea everyday since starting it. 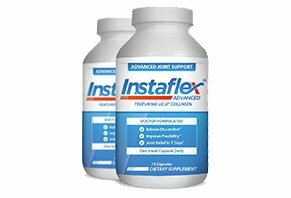 I didn't want to believe it had what other arthritis formulas that I am allergic have, shellfish, etc., but after doing research, I found that this Instaflex Advanced with UC II Collagen still has what its original formula does. Please do not misrepresent as there are people like me who cannot use stuff like this no matter how much pain we're suffering. I took it the full two-week bottle hoping I was wrong. Then my diarrhea became uncontrollable. Had to stop. Thank you so much for clarifying the effectiveness and side effects of Instaflex Advanced. It is a serious matter to decide between possible pain relief and certain diarrhea. I looked long and hard for this information. It was not easy to find. Thank you! I took InstaFlex Advanced. My joints felt better. However, I then got serious intestinal cramping, diarrhea, experienced hair loss, sores on skin, and dandruff. This was certainly not for me. I have had the dermatological effects. I started losing my hair after about a month of therapy. There was some improvement in my knee but I didn't want to become bald, so I stopped. In about two weeks I noticed that I was no longer losing hair. I have discontinued using the product. I have used Swanson's Glucosamine, Chondroitin and MSM with Hyal-Joint for many years. In order to determine the effect of Instaflex, I stopped taking the Swanson product for two weeks before starting Instaflex. A. I took the Instaflex exactly as the customer service rep said to take it. B. I started to have mild consistent pain in my knees at all times. On a level of 1 to 10, this was a 2 to 3. C. When I played tennis, I started to get much more pain after about an hour. This reached a 6 to 7 level each time that I played. The pain would remain well into the evening. D. After the trail, I went back to the Swanson product, and after a few days, the consistent pain was gone again. When playing tennis there is only a mild pain (level 4-5) when a wrong twist is made, but it goes away in a minute or two. This product made my pain worse, but maybe it will work better for you. After taking it for only two days (two capsules), I have had severe cramps and diarrhea for 5 days now, it has left me tired. I have never reacted to any products before, so this is a surprise for me. I now will seek out a physician to help me recover. They repeatedly say to check with your doctor “before “ you take the product. Don’t you know how to read? Customer care is not truthful, satisfaction is NOT guaranteed, and I was not able to return the product because it did not work. I would never recommend this product to anyone for any reason. Hi, I have bad knee joints. I started using Instaflex with the ad you can try it for free. The catch is you have to give them your payment in advance. After one month use, I saw no difference so I figured I'd give it at least three months. So, they automatically charge you after the first month. Then when I realize this product is a fraud, I go to try and cancel, and there's no cancellation. I had to go to my bank to actually make them stop paying them for a product that does not work! The only thing that was worse than trying this useless product was wasting my time talking to one of the worst customer service organizations on the planet. They didn't even have the decency to stand behind their advertised return policy as stated in their advertising. Trust me, you don't need the aggravation.